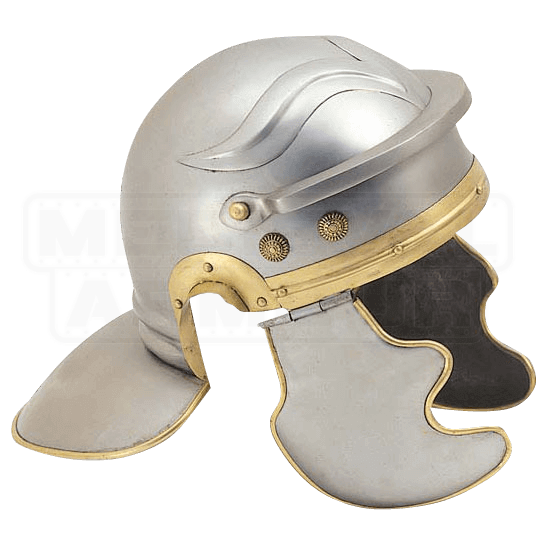 Our Roman Troopers Helmet is a typical Roman Soldiers helmet that has been copied from originals that have been found and are now in museums. It features hinged cheek plates and brass fittings. An inner adjustable leather liner lends a touch of comfort to its fit, and a chin strap helps secure it to the wearer. This helm is formed of 18 gauge steel and brass, making it perfect for those who wish to create an authentic Roman soldier look.